The winter storm we have been talking about for several days now is going along as planed. The track has shifted slightly north, but amounts and strength of the system have not budged in the past 3-4 days. Model consistency between today's runs and today's models is very good, with the NAM being a northerly out layer. The GEM model actually has a solution similar to runs done on Friday, where the axis of heavy snow is set up from Milwaukee to Detriot. However, we expect this model to conform to the northward trend in the coming runs. 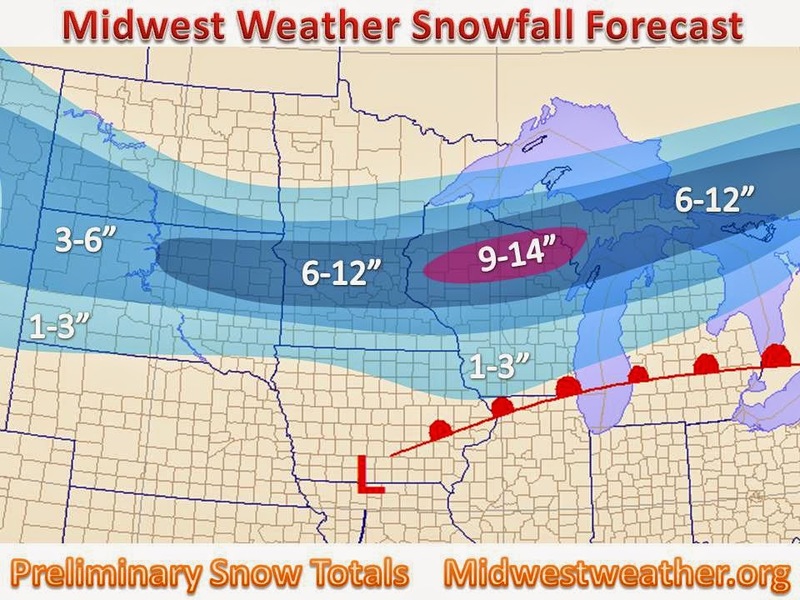 Amounts vary somewhat in the models, but generally a solid area of 6-12" is likely, as shown above. 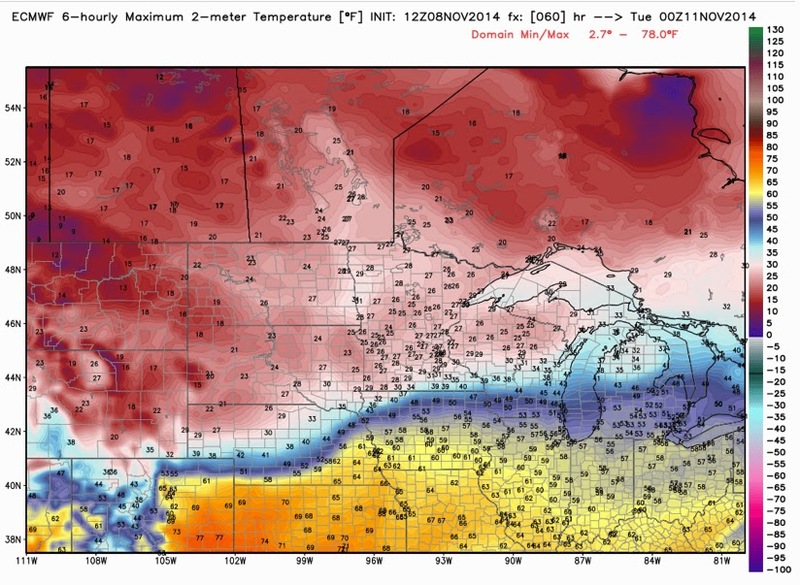 A pocket of strong forcing and convergence will create a band of 10"+ that will likely set up in northern Wisconsin. Winter storm watches are already posted (see map on left) for the first winter storm of the year. These watches will switch over to warnings by Sunday night and the storm approaches. This is a classic spring time winter storm set up, with warm moist air to south crashing into cold Canadian air in the north, below are the forecasted highs from the ECMWF computer model. The main question in this system will be what happens as the actual area of low pressure passes through Monday night and Tuesday. Models are not putting much snow down in Iowa and southern Wisconsin Monday night, but with a ~1000mb low pressure and cold air wrapping in by that time, the atmosphere will be conducive for a few inch of snow as it pulls away to the northeast. Be sure to keep it here to Midwestweather, for updates on the storms and any tweaks that may be necessary to the snow map.